This has been quite a good Scouting term. We were sorry, however, to lose Troop Leader Sykes, P/L's Pledger and Cogbill, and Scouts Cook, Field and Plumb. Atkin and Dann have been promoted to P/L of the Peacock and Woodpecker Patrols respectively. We have had the usual number of recruits, most of whom have passed their Tenderfoot. Advantage was taken of the better weather at earlier meetings in the term, and we now have two First Class Scouts, while several others are well on the way. Second Class work has also been in full swing. With regard to the lighter side of meetings, several ingenious games have been introduced and have proved popular. The result of the Stratton Ambulance Competition held last term was announced recently. The School Troop succeeded in gaining second place. Captain King visited us on November 26th; he was accompanied by his new assistant, Canon Brown, who visited us for the first time. This year's summer camp was held in North Devon; a report of it is found elsewhere in the Magazine. All our veterans agreed that this was by far the best site they had camped on. It consisted of a narrow strip of grass land in the bottom of a very deep combe or valley, which came down to the sea at Lee Bay, two miles west of Lynton in North Devon. Both slopes of the valley were thickly wooded, the western slope being covered with larch and the eastern with oak and ash, and with an undergrowth of hazel, brushwood and brambles. There were also wild strawberries and wild raspberry canes. In the bottom of the valley, just along the Camp Site, was a rapidly flowing stream with many good trout in its pools, which also provided many refreshing dips. In the centre of the site a very convenient fallen tree provided an extremely good seat, especially at meal times. Firewood was also very abundant, and a very good spring near at hand gave us an excellent supply of drinking water. Along the west side was a track leading down from the farm to the cliff road from Lynton to Martinhoe and Woody Bay. By using this path it was possible to reach the sea in little more than a quarter of an hour, although the 550ft climb made the return journey rather longer. The length of the walk, however, was compensated by the beauty of the surrounding woodlands. There was a profusion of wild life of all kinds. Bird life included jays, magpies, owls of three kinds and two kinds of hawk, as well as an occasional sea-gull. Moles (as the SM found out only too well), rabbits and field mice also abounded, while a large number of trout and a few eels were seen in the stream. Throughout the duration of the Camp brilliant sunshine was general for the whole of the day. Indeed, the rainfall was confined to three slight showers during the first two days, and a small but heavy shower during the night of the second Wednesday. This was, however, followed by the return of the usual brilliant conditions by 10am. While at Camp, B Stubbins and L Martin completed their 2nd Class tests. J Atkin, J Pledger, P Smith and G Wright succeeded in their Swimming test for the 1st Class badge. P/L P Pledger was successful in his Axemanship test for the 1st Class badge. Other minor tests which were passed can be found under Scout News. Weather: Light rain and drizzle; fine intervals. Left Ely in drizzle at 8.43 am after wishing P/L C Parker and No.2 N Field "God Speed" on their Lake District cycle trip. Arrived at Liverpool Street at 10.45 am Went by Underground to Paddington where we dumped the kit-bags and went for a look round the station. Many were interested in the USA sailors. Left Paddington at 12.5 pm and soon ran into fine sunshine, which decreased, however, as we neared Barnstable. Arrived at Barnstaple at 4 pm to find a drab, uninteresting Devon, not at all like the Glorious Devon about which we had heard so much. We left Barnstaple junction with our luggage in a bus en route for the site. Rain continued, but we were cheered considerably by the magnificent view of the landscape which was spread below us like a patchwork quilt. After meandering up hill and down dale and creeping and squeezing through narrow gateways, we were finally dumped about a mile from the site. We waited for a horse and cart (which had been chartered to carry our kit to the site) in a shed, where, despite the grim outlook, a cheerful spirit prevailed, mainly due to the musical efforts of the Harmonica Trio, an enterprising group of young Mouth Organists. We finally left for the site at 5.30 pm and arrived there at 6 pm The weather was still doubtful, although the rain had stopped for a time. Finally we pitched Camp and got settled and had late tea at 7.30 pm Light rain began again after tea, and we turned in to enjoy a good night's rest at 8.30 pm. Weather: Dull and overcast; no sun. After breakfast the usual first-day-in-camp jobs were done. Refuse pits were dug and kitchen laid out. Wood collected. ASM took juniors to explore stream and woods. Stream proved to be a typical West of England hill stream, with deep pools and miniature waterfalls everywhere. Insects abounded. Dinner at 2 pm followed by a good rest. ASM and seniors went to Lynton via the Cliff path. Distance found to be about three miles. Returned at 5 pm to discover that SM whilst exploring the brook, had caught a fairly large trout, which he explained he had already eaten. Juniors had been bathing in the stream. After tea, the whole Troop explored woods and stream. No more trout caught. Weather: Overcast sky; no change. Late breakfast followed by Parade and Service. Tent Inspection at 9.30 am and further exploration of surroundings until dinner, after which we went bathing at Lee Bay, about one mile from the site. The water was cold but we all felt better for it. The weather showed signs of improving and the sun came out at about half-past five. Tea at 5.15 pm After tea, ASM experimented with the problems of Stream Drainage and Irrigation. Dams were built at various intervals in the stream, and pools varying in depth from two to four feet were made. "Slogger" drenched ASM whilst the latter was posing on the margin thereof. "Slogger" was soon rounded up and "larnt"
Supper at 8.30 pm Prayers and bed at 9 pm followed by Lights Out at half-past nine. Weather: Beautiful clear blue sky, with hot sun. 7.30 am Reveille and Wash. 8.0 am .. Breakfast. 8.30 am Tidy tents and put on Uniform. 10.30 am Jobs or Spare Time. 1.30 pm until 2.30 pm Rest Hour. 2.30 pm Bathing and Spare Time. Impromptu dinner of fried eggs, fried onions and potatoes, owing to non-arrival of sausages. ASM and T/L R Sykes went to Lynton in the afternoon, while the remainder bathed in glorious sunshine at Lee Bay. Tea at 5 pm followed by wood collecting and exploring. Turner tries his hand in vain at trout fishing, but succeeds in making, with the aid of his confederates, a magnificent pool, which was to serve a splendid purpose later on. Weather: Another glorious day, warm sunshine and blue sky. Breakfast early. The usual hour's badge work took the form of two walks. The first, by the juniors to Lynton; the second, a ramble round Woody Bay, Martinhoe and Lee Bay by a few seniors. The latter walk, owing to the heat and various other inconveniences, gave "Dinkum" a magnificent scope to grumble and he did not miss the opportunity. All were ready to devour a splendid dinner at 1.30 pm as the air had whetted our appetites. Afternoon spent in woods and in stream. Many went to the top of the valley and saw the Valley of Rocks from above. Tea at 5 pm followed by games with Rugger ball, in which we must admit that "Kong" did get rather tough. Two seniors, while exploring the woods, found a wounded wood pigeon. They killed it, cleaned and stuffed it, and by means of an improvised spit it was cooked over the glowing embers of the fire. Supper was at 8.30 pm followed by Prayers and bed at 9 pm and Lights Out at 9.30 pm. Weather: Perfect - we now have sunshine from dawn till dusk. T/L R Sykes and R/S V Freestone took youngsters to Lynton after breakfast. Seniors collected wood and explored wood and stream. Sun bathing and a long rest hour took up most of the afternoon, and an early tea enabled a band of seniors to go for a ramble round the coast. Upon returning, it was found that GW and Turner had caught a rabbit, which was cooked for supper. SM and ASM went to Lynton. Supper and then Prayers, followed by a sing-song, in which the efforts of the Harmonica Trio were greatly appreciated. Bed and Lights Out at 9.30 pm. Weather: Still perfect-sunshine from dawn till dusk. Badge work, then youngsters explored moorland above valley, while seniors went to Lynton to fetch liver, which they were told had already been sent. However, dinner was late owing to non-arrival of liver! Bathing in afternoon followed by return to Camp only to find that a certain corpulent gentleman had committed the crime of sleeping on duty. He was forgiven, however, as it was decided that the greater the weight of a person the more sleep he requires! Moorland explored by seniors after tea. " Basil " and " Coggy " discover a rabbit warren in a field. This led to repeated visits to the field by all members of the Troop later on. Supper and Prayers at 8.30 pm followed by a sing-song and then to bed. Lights Out at 9.30 pm. Badge work in the morning, followed by a walk to Woody Bay via Lee Bay and Martinhoe. Here again "Dinkum" was not lacking in his usual dry comments concerning the weather and everything in general. Came home tired but cheerful to find dinner ready. Long rest hour, followed by bathing which was somewhat marred by the appearance of thousands of jelly-fish, which, although harmless, were very uncomfortable. Fishing in rock pools was very popular, and great fun was caused when several unfortunate members became a little too excited and fell head first into the pools. All were ready for tea, during which the cake was more than generously given out. After tea, games on top of the valley. Supper at 8.30 pm followed by Prayers and sing-song, during which the efforts of the Harmonica Trio were greatly appreciated. Went to bed, feeling that this was the best of Camps, and as we snuggled into our warm blankets we were gently lullabied to sleep by the babbling stream and the mournful cry of an owl. Weather: Still absolutely perfect-sunshine from dawn till dusk. Arose early and had breakfast. Went to Woody Bay station to bid farewell to R/S V Freestone, who was leaving us, and to ASM who was paying a brief visit to his home at Torrington near Barnstaple. After seeing them off, we completed our knowledge of the neighbouring countryside by visiting Caffins, Barbrook Mill, Lynmouth and Lee Bay. We bathed after dinner and saw the Pan-American Clipper of the new Transatlantic Air Service as she was flying from Foynes (Ireland) to Southampton. After tea we attended the Walthamstow Troop's Camp Fire on top of the valley. Here again the Harmonica Trio showed their form. Arrived home at 10.30 pm where Tilly lamp proved very useful in the dark lane. Up late, owing to late retirement on the previous night. Tent inspection followed by Flag Break and Prayers. After this, the good swimmers dived from the rocks at high tide in Lee Bay. Lazy afternoon in the sun. Many fished, bathed and built dams in the stream until tea. After tea Rugger was played, but owing to the heat and sheer brutality of the tough members of the Troop, it did not last long. Early retirement after Supper and Prayers. Early breakfast, followed by the ASM taking all but two of the Troop for a walk, starting with the Cliff route to Lynton. Down to Lynmouth, some members taking the cliff railway. Then up the Lyn valley towards Watersmeet. Considerable time spent on photography. Half a mile below Watersmeet, party took up position in mid-stream for lunch and for a very welcome cooling of the feet. Menu consisted of sandwiches, cake and chocolate. Various members of the Troop were very interested in monkeys, obvious not-so-complimentary resemblances being alleged. Crossing the river below Watersmeet, we followed the West Lyn past the falls and came out on the main road for a while, leaving it as soon as possible to search for Beggars' Roost Hill. Our first attempt brought us to a farmstead rejoicing in the name of Cheriton. Turning eastwards, we were easily out-distanced by a rabbit who passed us quite fearlessly in the open fields. A halt was now made for further sustenance, and we crossed the West Lyn again and proceeded to lose half the party in a wood beyond the stream. After meandering about for some time the lost sheep returned to be greeted with reports of wild strawberries. We then came unexpectedly on Beggars' Roost Hill, which we had given up as lost. Its boulder strewn surface and fearsome gradient of 1 in 3½ spread a wave of horror, from which the party recovered on finding a spring at its base. A long and tedious climb from Barbrook through seas of melted tar gave us a good excuse for taking to the abandoned railway after having a wild raspberry feast. On reaching the summit at Caffins, the party turned northwards across Caffins Down, dropping down the combe to the Camp, where a quick and refreshing bathe in the pools preceded a hearty meal. We discovered that the SM whose damaged knee had prevented him from accompanying the party, had caught three trout, ably assisted by "Smiler" and "Tubby." The corpses of the weary travellers were engaged soon afterwards in a game of ghostly Rugby. All were ready for bed at 9 pm and after Supper and Prayers we turned in, having enjoyed one of the best Bank Holidays for years. Weather: Still perfect, apart from a slight mist at sea in the early morning. Flying party sent to Lynton after breakfast; another party went later to collect presents. At about 10.30 am a sudden rise in the stream was noticed, which caused great excitement. In about five minutes the stream was a raging torrent. We found later that this was due to a sluice being opened at the farm. Water was required to turn a water-wheel and to fill the mill race the sluice was raised. Many saw the beautiful water-falls caused by this torrent lower down in the valley. The heat became overpowering by noon, and the afternoon siesta was followed by a visit from the District Commissioner, Brigadier-General HA Lomas, and his adjutant, who honoured us by staying to tea. Soon after his arrival the fishermen of the Camp returned in triumph, clutching a huge eel. Evening visit to beach brought a delightful day (though one of over-powering heat) to an end. Some members suffered slight indisposition during the night, owing to the heat of the previous day. Weather: Unexpected change in the form of a sea mist coming up the valley. Breakfast in tents. Weather cleared up and the sun came out at 10 am enabling Troop to bathe at low tide in Lee Bay. This morning bathe provided an unexpected thrill. Efforts were being made to refloat an auxiliary ketch of about 15 tons, which had been stranded on the rocks of the western horn of the bay as a result of the early morning fog. She was hard aground on the rocks at low tide, but it was hoped to get her off as the tide rose. A kedge was dropped to warp her off and the engines were started. However, though the sea was calm, the swell bumped her terribly, and finally she was badly holed, so that when the tide rose she began to fill, was abandoned and at last rolled on her beam ends, swept off the reef and sunk in the deeper water. The afternoon was spent in various ways. Some went to Lynton to finish present buying, while the remainder of the Troop went to Lee Bay and on to Martinhoe, returning via Woody Bay and Martinhoe Common. After tea, games on the south-east side of the valley. Camp fire of 1st Soham and Central Hall Troops on the Central Hall site. Arrived home at 10.30 pm. Weather: Rain during night; dull grey morning with Scotch mist. Awoke to find dull grey morning with a Scotch mist. A few showers caused breakfast to be served in tents. Badge work directly after breakfast, as rain prevented Parade. Hot sunshine by 10.30 am enabled the majority of the Troop to go bathing. The wreck could be seen quite plainly as it was low tide. Porpoises could be seen in the bay. After dinner we had a short rest hour, followed by packing all available gear. Small tents were also packed. The evening also spent in packing. Early to bed. Weather: Fine with heavy dew. Caught 10.44 am train to Paddington, going home by a different route. This time we branched off at Taunton to Bristol, Bath, Swindon and Didcot, instead of travelling via Westbury as on the way down. Arrived in London at 4.5 pm with comfortable time to catch our connection from Liverpool Street to Ely, which was reached at 6.23 pm. This term attendances have been well up to the average, in spite of the prevalence of illness in the School. Work has gone along well, and all the recruits have now passed their Tenderfoot tests. Full advantage has been taken of the fine weather, and open air work has occupied several meetings. During these meetings several have passed their Second Class tracking and Scout's pace tests - while some have passed their First Class signalling. An interesting innovation has been the making of plaster casts. Seniors have made casts of various animal and bird tracks. On March 4th Capt King, the District Commissioner, visited us and we had an enjoyable outdoor meeting. This term work has gone along well and attendances have been goad. Captain King visited us unexpectedly on May 13th. Much of the time in the earlier part of the term was spent in preparation for the Stratton Ambulance Competition. The examination for this was held on June 3rd. The following week-end about thirty Scouts spent an enjoyable time in camp on the School Field. In badge work, a number of the more junior Scouts are well on the way to obtaining their Second Class badge. Several seniors have almost completed their tests for the First Class Badge. Four seniors, Atkin, Hughes, Martin (R) and Lovering, have obtained their Ambulance Man Badge, and Taylor (J) has got his Artist's Badge. Efforts have been made to obtain a site in Norfolk for this year's Summer Camp. As they were unsuccessful, it was decided to go to Robin Hood's Bay, Yorkshire, again. This year twenty-nine boys, a record number, will be going. Richard Pledger 15 Apr 10: Dinkum is mentioned in the report of the Summer Camp at Croscombe Barton 23rd July-6th August, 1937 in the log for the eighth day Friday, July 30th - Here again "Dinkum" was not lacking in his usual dry comments concerning the weather and everything in general. Dinkum was my father Peter Pledger. He was born at Walton House in Fordham on 10th April 1920 and was the eldest son of Frederic Hugh Pledger (known as Bill) and his wife Doris (née Newport). Bill and Doris went to live in Queensland Australia in the 1920s where their second son Malcolm Newport Pledger (known as John) was born in 1925. Doris was taken ill in Australia and she returned to live at Walton House with the children, we think in 1932. She worked for HA Newport and Allen Newport Ltd. Bill returned a year later having settled the familys affairs in Australia and also worked for Allen Newport Ltd.
On returning to Fordham my father - who have started directly at SGS aged 12 - would have had a noticeable accent and was thus given the nick-name Dinkum. He was made to wear shoes to go to school which he found uncomfortable after so many years barefoot. He died on 26th April 2002 at Chichester in West Sussex. 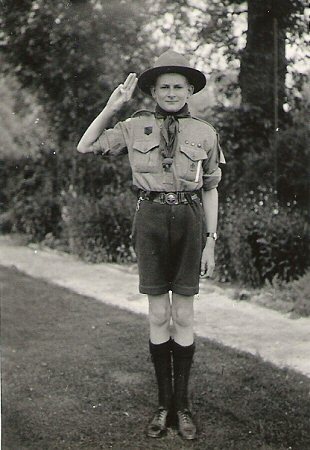 The photograph is of him taken, I think, on departure for Summer Camp in 1936 - he appears to be an APL. John was born in Mackay, Queensland on 18th March 1925; he was 80 when he died on 31st January 2006 in Southampton, Hampshire. He also attended Miss Kennedys School in Soham, as I have heard his cousin Jean Stafford Smith and my Aunt Phyllis Gibson reminiscing about the good old days.